passing someone’s country place, we see an impressive rack of moose antlers displayed on the front porch. my, the way they flatten out like that, they look like a pair of wings! i wonder if the fellow would consider selling them? dear me, that does beat an outing to the corner shop. big time adrenaline stimulation there, i would say. technical aspects first: find the angle of attachment, get a jaunty tilt to the wings: lift off. then, find the form of the piece: stylise feathers, interlock, undercut, pierce: my spectrum of carving techniques built up over all these years. 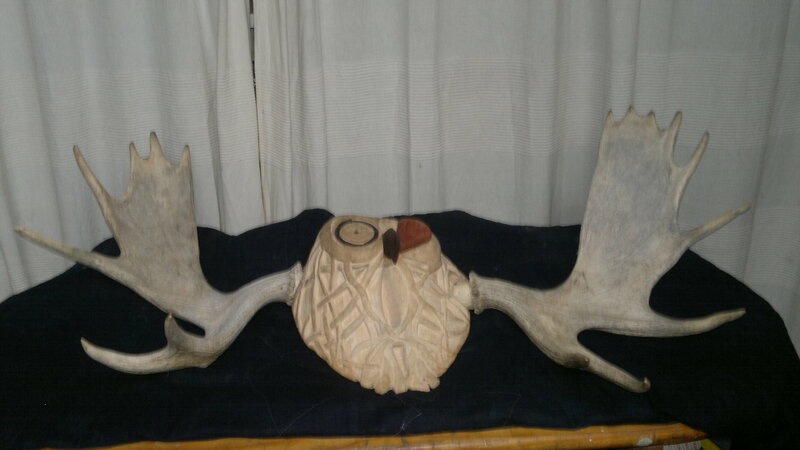 incorporate elements: ebony and blood wood, eyes and beak to go along with the antlers. was going to do talons, did cut them out, then decided against them: keep the line simple, save up the claws for some future project. use a paper template for placement.